The national workshop on “Repair and Maintenance of Scientific Engineering Equipments in Universities, Research Institutions and Small Scale Industries” concluded on November 17, 2011, after training more than twenty seven (27) participants including engineers, researchers and students of various institutions from Egypt. 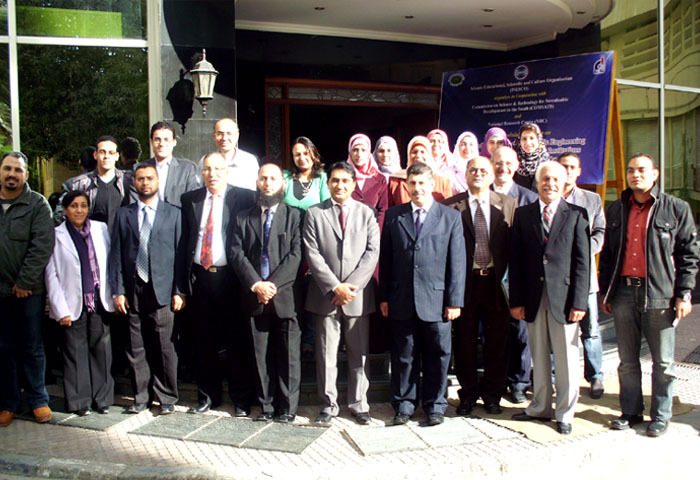 The workshop that started on November 13, 2011 was organized by the Commission on Science and Technology for Sustainable Development in the South (COMSATS), the Islamic Educational, Scientific and Cultural Organization (ISESCO) and the National Research Centre (NRC) of Egypt, under the COMSATS-ISESCO Cooperation Programme-2011. This event was a continuation of the joint activity on same theme that started back in Sudan (2004) followed by similar national events in Sudan, Syria and Senegal. 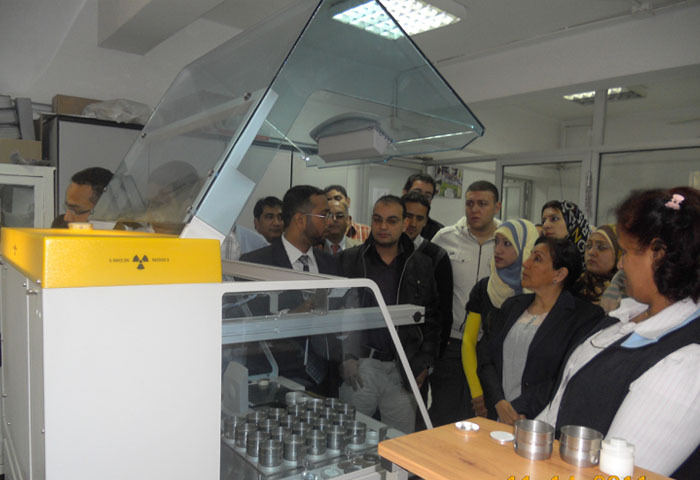 The main objective of this workshop was to develop indigenous capacities of Egyptian scientists and institutions to be able to repair and maintain their scientific equipment and keep them operational, through hands-on training. 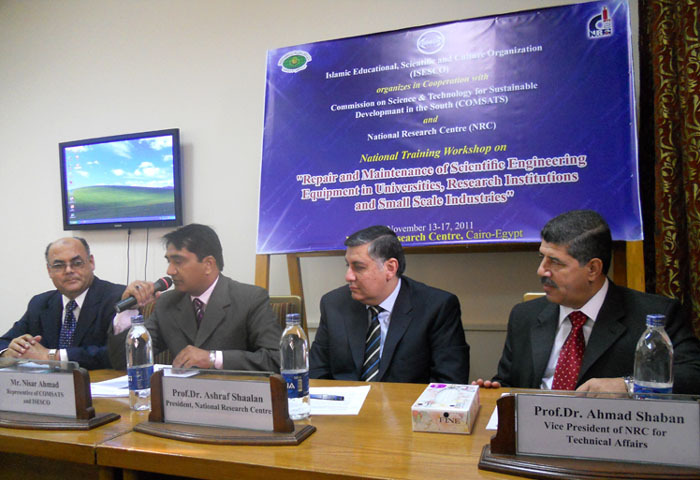 The inaugural ceremony of the workshop was held on November 13, 2011, at NRC, and was addressed by the Prof. Dr. Ashraf Shalaan, President NRC; Prof. Dr. Ahmed Shaban, Vice President NRC ; Prof. Dr. Kamal Ahmed Abed, Head of Mechanical Engineering Department of NRC. COMSATS and ISESCO were represented by Mr. Nisar Ahmad, Senior Assistant Director (Systems)-COMSATS, who also read out messages from the Director General ISESCO and Executive Director COMSATS. Other distinguished guests of the occasion included, Prof. Dr. Osama El-Shabrawy, Former President NRC; Dr. Matsushita Yoshihisa of JICA; representatives of Egypt – UNESCO World Heritage Centre, Egyptian-Japan University of Science and Technology (E-JUST) and government ministries and agencies; as well as representatives from the private sector of Egypt including pharmaceuticals, and academia. In his welcome address, Prof. Abed, applauded the efforts made by COMSATS and ISESCO Center for Promotion of Scientific Research (ICPSR) for their support in organizing the workshop and also highlighted the importance and the workshop. Speaking on the occasion, Prof. Shalaan highlighted the ever-increasing role of repair and maintenance of scientific equipments to achieve operational efficiency viz. R&D work in universities and R&D institutions. Prof. Shaban, appreciated COMSATS and ISESCO for organizing the workshop at NRC and suggested to have such activities at NRC on annual basis. The message of the Executive Director COMSATS highlighted the need of the repair and maintenance in smooth operation of the R&D activities in universities, research institutions and small scale industries. Highlighting similar joint activities held in other OIC member states by COMSATS in the past and those held in Egypt over the years, Dr. Qureshi hoped for the success of the workshop and proved to be a good learning experience for the participating institutions and individuals. Emphasizing on the workshop theme and related issues that needs to be addressed at the national and regional levels, H.E. Dr. Abdulaziz Othman Altwaijri, Director General ISESCO, deemed it important to strategize for effective management of spare parts to maintain, ensure and strengthen the reliability of the machines in order to achieve continuous production and avoid costly downtime in the maintenance of scientific equipment. Dr. Altwaijri considered it important for a country to regularly allocate a budget for repair of scientific research equipment and relevant training. Acknowledging COMSATS’ and NRC’s contribution for holding the workshop, Dr. Altwaijri expressed special gratitude towards Dr Imtinan Elahi Qureshi, Executive Director of COMSATS, for his valuable support towards the event. He expressed his satisfaction over ISESCO-COMSATS collaboration that started in 2004 and reaffirmed the participants of ISESCO’s readiness to increase the number of such workshops in the OIC Member States. 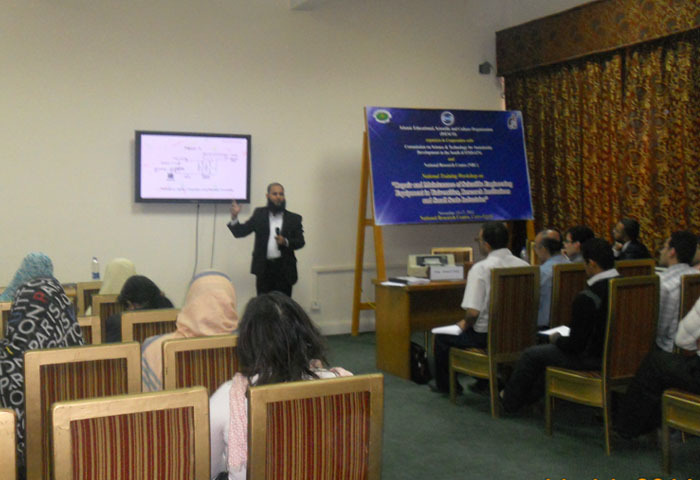 Two subject-experts from Pakistan Council for Scient ific and Industrial Research (PCSIR), Pakistan, Mr. Arif Karim and Mr. Faisal Ghazanfar, imparted training to the Egyptian scientists, engineers and technicians during the 10 technical sessions of the workshops on various topics including: PCR Systems; Gas Chromatographic Systems; HPLC Systems; Mass Spectroscopy; Mass Detectors and Mechanics; Hands-on Repair Training (MS/GC/HPLC); Thermal Analyzers; High Temperature Pressure Reactor (HTPR); Pressure Composition Isotherm Measurement Systems. The sessions comprised hands-on training complemented by lectures on the theme of the workshop. To consolidate the trainees’ learning, visits were made to various labs of NRC including XRF Lab, Thermal Analyzer Lab and Pressure Composition Isotherm Lab. The closing ceremony of the event was held on November 17, 2011. Prof. Dr. Abed and Mr. Nisar Ahmad gave a vote of thanks, while Dr. Shaban gave the closing remarks. Also, the trainees’ received certificates of participation. The workshop resulted in training more than twenty seven (27) participants including engineers, researchers and students of various institutions from Egypt. 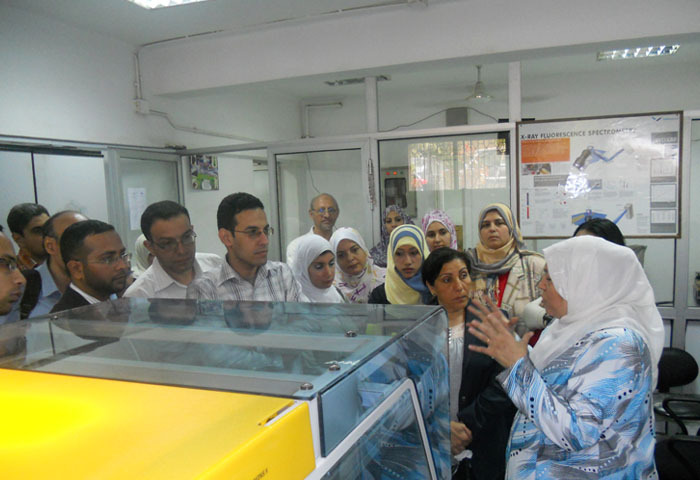 The workshop is expected to have developed an indigenous capacity by training the master-trainer for maintenance of scientific equipment used in the academic and research institutions of Egypt, enabling them to locally address the maintenance issues of the important and very expensive scientific equipment to facilitate local industry and research labs.